We used new yukon gold potatoes, but any variety of new potatoes, or red potatoes will work well. Scrub each potato clean with a scouring pad (or the abrasive side of a dish sponge). New potatoes have a very thin skin. You don't have to scrub all of it off, just get at least half of it off. 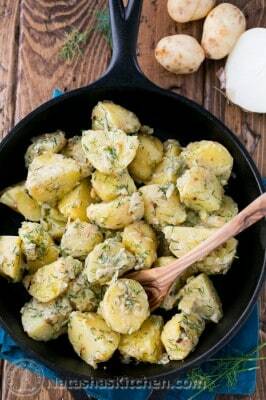 Leave bite-sized potatoes whole and cut larger ones in halves or quarters so they are about 1" thick pieces. Place potatoes in a pot and cover with cold water. Bring to a boil, add 1/2 Tbsp salt and boil for 15-20 minutes or until easily pierced with a fork. Drain potatoes. In a separate pan, add 1 Tbsp olive oil. Add finely diced onion and saute over medium heat until golden and soft. Add 1 pressed garlic clove and sauté another minute, stirring constantly. Add 3/4 cup heavy whipping cream and 1/2 tsp salt, or add salt to taste, bring to a boil and let simmer an additional 2 minutes. Stir in 1/4 cup chopped fresh dill then remove from heat and pour sauce over potatoes. Toss potatoes in sauce until evenly coated. Cover with lid to keep warm until ready to serve. To reheat, place on an oiled skillet and saute until hot and crisp. Yum!